I’ve been a huge Manchester United fan for many years now and try to religiously follow their games wherever I am. Admittedly, it can be hard to follow some of their games especially if you’re in Asia because of the time difference. But when I do get to catch a game, it’s truly a wonderful experience, especially when they win. One thing that makes football such a great sport is that it is truly a spectator sport. Watching a game by your lonesome inside the comfort of your home may be a great experience, but watching it with fellow Manchester United fans (who are by rights, a rabid bunch of supporters) turns it into a transcendental experience. You collectively hoot for each goal made or groan with every missed goal. If you’re in Thailand and you’re a Manchester United fan (or just a fan of Premier League football) then you have to make a stop at the Manchester United Restaurant Bar in Bangkok. The ManUtd Restaurant Bar is an officially licensed Red Devils-themed restaurant and Bar that serves Thai, Asian and international cuisine. 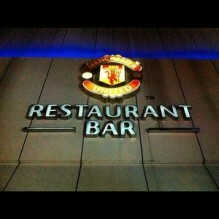 It is the official home of Manchester United fans in Thailand. This is the perfect venue to express the love for the Red Devils. The Bar airs live games of Premier League that feature Manchester United so expect boisterous levels of fan love during game day. Fans can even buy officially licensed Manchester United merchandise inside, which is a treat especially for people who live in countries that do not have an official Manchester United establishment like this. Zach is a huge Manchester United fan and has been supporting the Red Devils since he was a boy. He’s also a freelance writer and blogger. Right now he is based in Bangkok and attending a Thai Language School.